Human Galectin-9, His Tag (LG9-H5244) is expressed from human 293 cells (HEK293). It contains AA Ala 2 - Thr 323 (Accession # BAA31542). The protein has a calculated MW of 36.6 kDa. 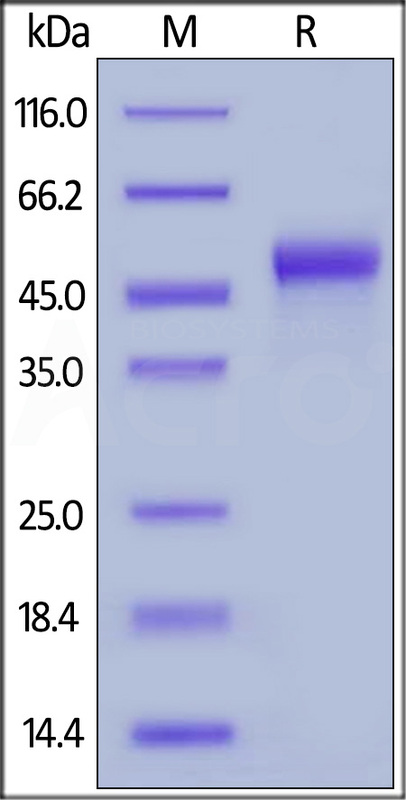 The protein migrates as 45-55 kDa under reducing (R) condition (SDS-PAGE). Lyophilized from 0.22 μm filtered solution in 20 mM MOPS, 50 mM NaCl, 1 mM EDTA, 2 mM DTT, pH7.4. Normally trehalose is added as protectant before lyophilization. Human Galectin-9, His Tag on SDS-PAGE under reducing (R) condition. The gel was stained overnight with Coomassie Blue. The purity of the protein is greater than 95%. Galectin-9 (LGALS9) is also known as tumor antigen HOM-HD-21 and ecalectin. Galectins are a family of proteins defined by their binding specificity for β-galactoside sugars, such as N-acetyllactosamine (Galβ1-3GlcNAc or Galβ1-4GlcNAc), which can be bound to proteins by either N-linked or O-linked glycosylation. As for Galectin-9, it has high affinity for the Forssman pentasaccharide, and it is also the ligand for HAVCR2/TIM3. Forthermore, Galectin-9 stimulates bactericidal activity in infected macrophages by causing macrophage activation and IL1B secretion which restricts intracellular bacterial growth. (1) Tuereci O., et al., 1997, J. Biol. Chem. 272:6416-6422. (2) Dai S.Y., et al.,2005, J. Immunol. 175:2974-2981.